March 2012: What I bought | Save. Spend. Splurge. I am not going to apologize for this month because I bought some pretty amazing, one-of-a-kind, independent and/or vintage pieces. I guess I could pretend to vow to eat beans and oatmeal for the rest of the month… but we all know that’s a baldfaced lie, so why bother? Cost $99 to buy, and my monthly plan is about $70 a month (ick). However, this phone has come in pretty handy (it let me book car rentals on the fly for cheap), and I can check all my email accounts at once rather than signing in and out of each account each time. 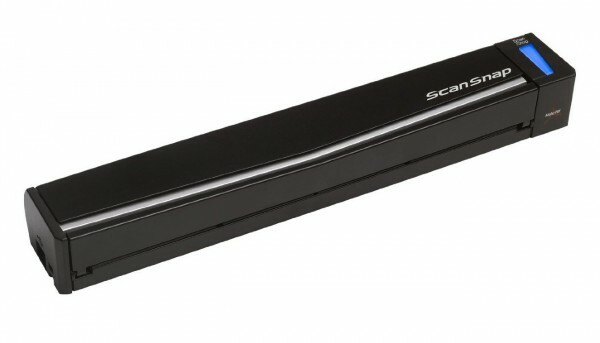 The Fujitsu ScanSnap S1100 Mobile Scanner was originally $190, I had a $50 gift card, so I got it for $140. It’s a DREAM. I need a scanner far more badly than I need a printer, and I needed a mobile option to scan my receipts, expense reports and documents. A life saver, I tell you. From Marcelle BB Cream, it is my new makeup love. I forgot to mention that I did purchase the Marcelle BB cream last month, and I absolutely love it. I had to buy both bottles, Light to Medium and Medium to Dark. It turns out, since wearing sunscreen, my skin has faded from Medium to Dark, to Light to Medium, so now I’m just using the lightest shade exclusively. Now my concealers and foundations are ALL THE WRONG SHADE. Grr. It’s a wonderful product, and it looks like I am not wearing ANY foundation, unlike Bare Escentuals (skin looks slightly sparkly/shiny, which is better for night), or any powder compact (Stila). Check out Rae of theNotice’s review of the Marcelle BB Cream here. ..to cut up and wear in my hair. This tutorial for a ‘sock bun’ is awesome. I’m rockin’ the sock bun as we speak and it looks like I have four times the amount of hair I should. It also makes all of my hair buns look so much better. I normally hate wearing my hair in a bun because it’s SO TINY and it looks so strange, but this is a hot look. 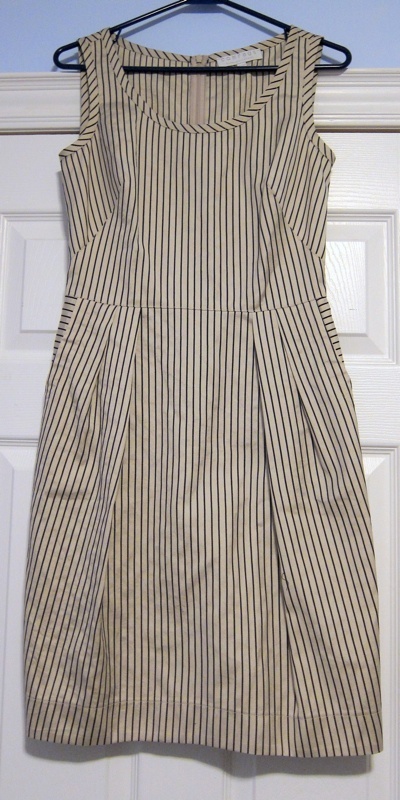 This is an item on my Wardrobe Wants list, called: Striped Dress (French/Nautical Style). Now I can cross it off the list because I own one! Purchased at Comrags @654 Queen Street West, an independent Toronto store (Yelp review of Comrags), the dress is pricey, (my limit is about $100 – $150), however this dress is just so simple, rumpled but elegant at the same time. Absolutely washable (no dry cleaning!) and did you notice the POCKETS, and the stripes going different directions, looking absolutely fab? It also gives me the illusion of hips, being it’s a tulip-style skirt. YESS!! My first ever DvF dress, and I bought it for only $136 at a secondhand consignment store called Haute Classics @ 946 Yonge Street in Toronto (Yelp review of Haute Classics Consignment). It’s a wool, and although it is a tiny, eensy, weensy bit small, it still fits beautifully because it’s a wrap dress with a stretch in it. Did you notice the POCKETS? Bought this also at Haute Classics @ 946 Yonge Street in Toronto (Yelp review of Haute Classics Consignment), and it was $50 CAD, originally retailing for $98 USD. Not on my Wardrobe Wants list.. but it was too cute to ignore. I normally hesitate at tops that go in at the waist because it waist is always at an awkward spot on my body, and then it looks like I’m sporting a baby bump, when I’m not. This one, is more at my natural waist, it has a section in front to cover any indecency, and the sleeves and overall drape of the stripes, soften my larger, inverted-triangle-body-shaped shoulders. J. Crew Blouson Stripe Dress was originally $148, I got 10% off, and after taxes it’s about $143. I LOVE this dress. I know I said I already bought a nautical French-stripe sort of dress that was on my list (oh and my new top looks nautical too), but this silk dress is a dream. It fits so well, looks fantastic, is going to be belted, and makes me feel so easy and chic. It is also navy blue, not black like in the photo. It’s incredible. 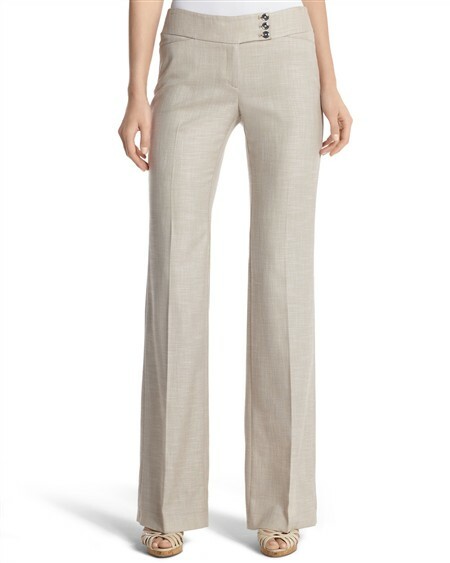 White House Black Market Neutral Flare Tweed Pants were originally $98, I got 10% off by being a new WHBM subscriber. I know you’re going to scoff at this, but I really needed new pants. These ones are a neutral tweed, but it has faint hints of gold running through the threads which are just gorgeous. I also didn’t want grey, black or navy blue (too many dark pants! ), so this neutral colour is perfect. They fit beautifully, feel like pajama pants to me, and are not too low-cut, as they sit just below the waist. Note: This was not a planned purchase, but a required one. Frankly, I don’t know WTF is going on, but I am losing weight like crazy and I am down to a size 4, but apparently a 2 or a 0 in J. Crew sizing. At any rate, I can feel that my old pants are far too loose now by about 2 sizes, and I would need to basically pin them closed at the waist to make them fit. Don’t be worried though. I am not stressed, I am not anxious, under-eating, dieting, and I don’t have an eating disorder. I am still eating a lot, but ever since I stopped eating junk and processed foods, my body has gone back to my high school size, which was about this weight and size. Bought at Saks Fifth Avenue on the sale rack for 30% off. It was originally $178 or something. Keeping in mind my new size, a few of my original work tops are too big. This checks off the box on my list of wanting a deep, red top to wear. I LOVE wearing red, it’s my favourite colour, and to find this shade, in silk, in such a perfect top, is a dream. AND ON SALE. An Ann Taylor white sleeveless pleated shell. Fits wonderfully, will be great for hot and humid weather, and isn’t sheer at all (it is lined). Purchased at The Cat’s Meow Consignment, an ultra-high end, spendy, vintage consignment store (Yelp review of The Cat’s Meow), this was something that I had to hem and haw over because it needed some tailoring (about $100 worth). Definitely NOT on my Wardrobe Wants list, but … I couldn’t say no (well, I COULD have said no, if the price tag was at its original $500 mark and that it would still require $100 in tailoring). It was obviously custom-designed and tailored in Paris (you can tell by the sewing), and the silk is what caught my eye. I am a huge fan of Monet’s Waterlilies (cliche, yes), and this dress made me think of it. Oh budgets. You’re so meant to be broken for pretty things. I can’t justify (yet) buying this amazing leather jacket I fell in love with. It’s this aptly named Perfecto leather jacket in Ink. Super light, a leather shell and it will get soft and oh-so-buttery in a heartbeat. It’s super light, very minimal, not fussy AT ALL and in a neutral shade that is not brown or black (although I kind of want the brown one too, but am definitely NOT going to buy two). ← What should my net worth be? Completely love the waterlily dress, it IS art. BB cream is a type of foundation made for scars and went huge in Asia. Google it, there are tons of brands an now American companies are coming with their own formulations. If it helps you save money, I think the blue leather jacket is hideous! And I love everything else. Thanks for the sock bun share too – I need to try this. I am thinking brown would be nicer. Great deal on the DvF!